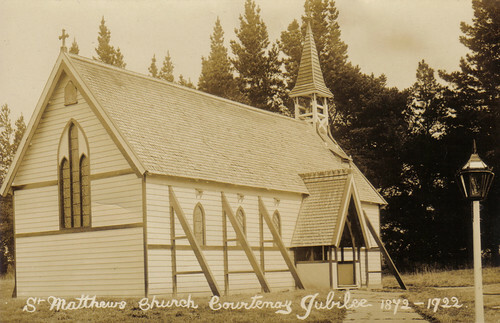 Here is a photo of St Matthew's Anglican Church, Courtenay, Canterbury, New Zealand for the 50 year jubilee in 1922. This is the old church. My ancestor Jabez Lord donated the land for the church in about 1871. It was designed by Benjamin Woolfield Mountfort in 1872 and consecrated in May 1875. It was demolished in 1937. 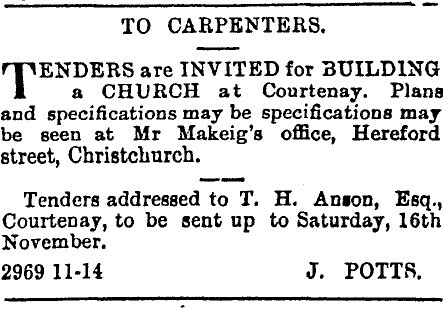 An ad was placed in the Press on 14 November 1872 inviting Carpenters to place tenders for the building of the church. Tenders were to be addressed to Mr T.H. Anson, Esq., Courtenay who was a local farmer and the advertisement was place by J. Potts (James Potts), who was a local civil engineer who worked on the Waimakariri River. Specifications, which would have been designed by Benjamin Woolfield Mountfort, were available to be viewed at Mr Makeig's office on Hereford Street, Christchurch. This is probably the office of George A. Makeig who was a house and land agent based on Hereford Street. The new church is a bit different with (if I remember rightly) a rough cast exterior. I found a blog which has photos of the gravestones if anyone is interested. You can see the full pictures for a small fee. Click here. As well as a small picture of the current church.